Recent release “Sturgeon Point” from Page Publishing author Edward Weil is both thrilling and provocative; this work tells a story about a group of friends on the fishing trip that turns into an exhilarating event no one will forget. Edward Weil, a devoted writer and author, has completed his new book “Sturgeon Point”: a gripping and potent work inspired by real life events mixed with heavy doses of exaggerations to create an enthralling work of fiction. Published by New York City-based Page Publishing, Edward Weil’s exciting work will leave the reader on the edge of their seat! What they wanted was to go on fishing trip to kick off what they hoped would be their best summer vacation ever, but what it turned into was beyond their wildest imagination. Instead of landing that prize fish at Sturgeon Point, they land smack dab in the middle of an international scandal that puts them head to head with the US military, US Secret Service, Columbian drug lords, and even the President of the United States. Now all they want is to escape with their lives. 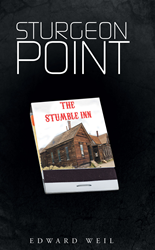 Readers who wish to experience this exciting work can purchase “Sturgeon Point” at bookstores everywhere, or online at the Apple iTunes store, Amazon, Google Play or Barnes and Noble.